You might wake up one morning and realize that your month-long runny nose, your swollen eyes, and that constant tickle in the back of your throat are all caused by one thing: your best friend. Allergic reactions to dogs are not pleasant to experience. Symptoms of dog allergies can be especially troublesome for people with beloved canines of their own. The good news is that you can avoid giving Fido away by speaking to your healthcare provider about possible allergy treatment options. Dogs produce multiple allergens that can be found in their hair, dander, saliva, and urine. All dogs produce these allergens, and some people are more susceptible to them than others. Why? Because people with allergies have sensitive immune systems, meaning their bodies can overreact to harmless substances, like dog dander. Allergy symptoms are just the body’s way of trying to destroy or get rid of the allergen. Of course, it is recommended that you speak with a medical professional before attempting to treat any condition on your own. If your healthcare provider determines that you have a dog allergy, he or she may recommend antihistamines, decongestants, or other drugs like steroids or nasal sprays. 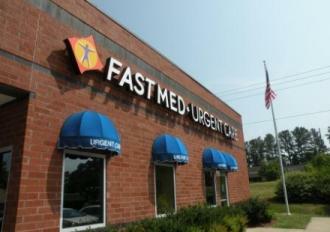 FastMed Urgent Care is a network of walk-in clinics throughout North Carolina and Arizona specializing in high quality, cost effective medical care every day of the year. Additionally, we accept most forms of insurance, never require an appointment, and have a strong commitment to providing a safe environment for patients, staff, and the communities we serve. Take a look at this to see why FastMed has been awarded the Joint Commission’s Gold Seal of Approval!